The Feast of theAnnunciation of Our Most Holy Lady, the Theotokos and Ever-Virgin Mary is celebrated on March 25 each year. The Feast commemorates the announcement by the Archangel Gabriel to the Virgin Mary that our Lord and Savior Jesus Christ, the Son of God, would become incarnate and enter into this world through her womb. The Feast of the Annunciation of the Theotokos is celebrated with the Divine Liturgy of Saint John Chrysostom which is conducted on the morning of the Feast and preceded by a Matins (Orthros) service. A Great Vespers is conducted on the evening before the day of the Feast. 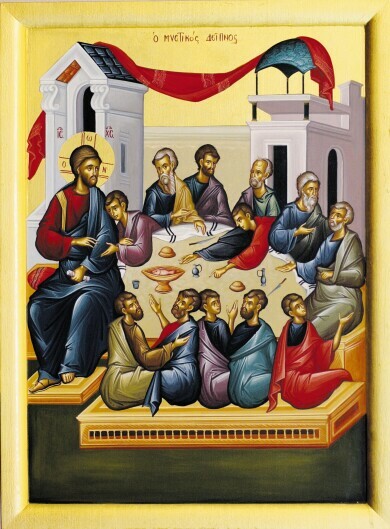 Scripture readings for the Feast are the following: At Vespers: Genesis 28:10-17; Ezekiel 43:27—44:4; Proverbs 9:1-11. At the Matins: Luke 1:39-49, 56. At the Divine Liturgy: Hebrews 2:11-18; Luke 1:24-38. The Feast of the Annunciation in the Greek Orthodox Church also marks a day of national celebration for the people of Greece and those around the world of Greek descent. It was on March 25, 1821 when Greece officially declared its independence and began the revolution that would eventually give the nation its freedom after 400 years of rule by the Ottomans. In addition to the services for the Feast, festivities and parades are held and official proclamations are offered throughout the world in recognition of Greek Independence Day. Today marks the crowning of our salvation and the revelation of the mystery before all ages. For the Son of God becomes the son of the Virgin, and Gabriel proclaims the grace. Wherefore, we also cry out with him, "Hail, O full of grace, the Lord is with you." Festival Icons for the Christian Year by John Baggley (Crestwood, NY: St. Vladimir's Seminary Press, 2000), pp. 21-30. The Festal Menaion. Translated by Mother Mary (South Canaan, PA: St. Tikhon’s Seminary Press, 1969) pp. 60-61. The Life of the Virgin Mary, The Theotokos, written and compiled by Holy Apostles Convent (Buena Vista, CO: 1989). The Synaxarion: The Lives of the Saints of the Orthodox Church, Vol. 4, compiled by Hieromonk Makarios of Simonos Petra and translated from the French by Mother Maria Rule and Mother Joanna Burton (Chalkidike, Greece: Holy Convent of the Annunciation of Our Lady, 2003) pp. 227-232.